Designed specifically for high-density computing environments, the Eaton BladeUPS® delivers 12 kW of efficient, reliable power in only 6U of rack space, including batteries. You can expand capacity by combining the 12 kW modules in a building block fashion to deliver up to 60 kW of redundant power from a single rack enclosure. Eaton has expanded the BladeUPS product offering and simplified it for easy customization, shipping, and installation. 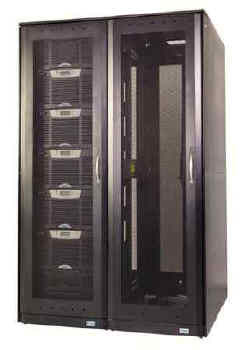 The Eaton BladeUPS Preassembled System is a truly turnkey solution for growing data center needs. You can order depending on your power requirements, preassembled systems with one to six BladeUPS units installed, providing the right level of power protection today while looking ahead to future growth. The top-entry models are ideal for data center environments that don’t have a raised floor and a flexible option is available to facilitate data center moves, additions or changes. Bottom entry models are also available. Each preassembled system comes with all the UPS modules and communication cards already installed. For BladeUPS systems with five and six modules, the internal batteries are shipped uninstalled for better weight distribution. is bring electricity to the unit and initiate the startup.